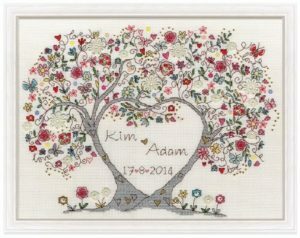 Love blossoms by Bothy Threads | Cross Stitching Heaven. Love Blossoms by Bothy Threads. 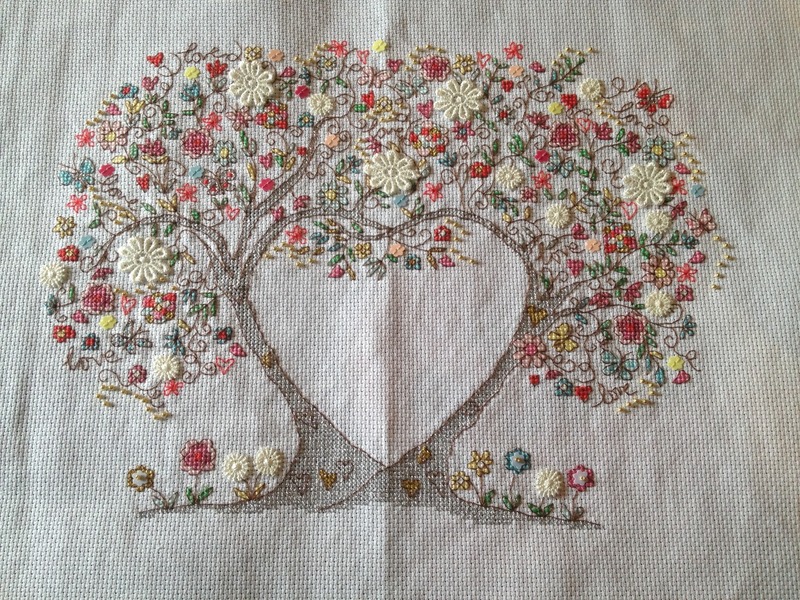 Love Blossoms by Bothy Threads is the second cross stitch kit I’ve had to complete, by them. They have a large selection of other beautiful cross stitch kits that can be seen or purchased here. Click on the image to Purchase it here. The design is on a 14ct Aida and comes with all threads and embellishments as shown in the picture. You need to be a fairly competent stitcher to complete Love Blossoms. It comes, complete, with metallic silver and gold yarns that from previous experience I know are difficult to work with. They kept snagging, separating and tangling as I pulled them through the Aida but found using them in shorter lengths meant I wasted less. I would not, therefore, recommend the kit to a beginner. Of course, you could swap the silver thread for a light grey and the gold for a beige brown but I think it’s worth sticking with the metallic threads because the overall effect is beautiful. Securing the threads is difficult because of the spacing between the separate sections. You must not be able to see them from the front. However, with careful planning, it is possible but it will increase the amount of time it takes to complete each section. The backstitch, although time-consuming, is what makes this project come together. Each separate flower, leaf and butterfly suddenly become transformed into this extraordinary piece of artwork. This together with the backstitching of the word LOVE at carefully positioned points in the tree canopy make this, I think, the most detailed and gorgeous project I have worked on. You add the embellishments (lace flowers, plastic flowers and gold beads) when you’ve completed everything else. Surprisingly they were a lot easier to apply than I first thought they would be. Keeping them in place requires one or two simple stitches, explained in the stitching pattern. Love Blossoms comes with an assortment of embellishments which means you will have spares if you follow the pattern. However, you can add more to create a more personalised finish to the project if you so desire! Love Blossoms by Bothy Threads is hard to complete. However, I am extremely pleased with the finished result. You will need patience and you will have to follow the pattern accurately. For tips on how to do this see my cross stitch tutorial. I would not recommend this kit to a beginner however an advanced intermediate should have no problem completing the cross stitch kit.